Choose a name (Such as Enable Defrag). Create a new Setting, choose Script for the setting type, and Boolean for the data type. $taskService = new-object -comobject "Schedule.Service"
Paste the PowerShell code below for the Remediation Script. $taskService = new-object -comobject "Schedule.Service"
Add this configuration item to a baseline and deploy to a collection. 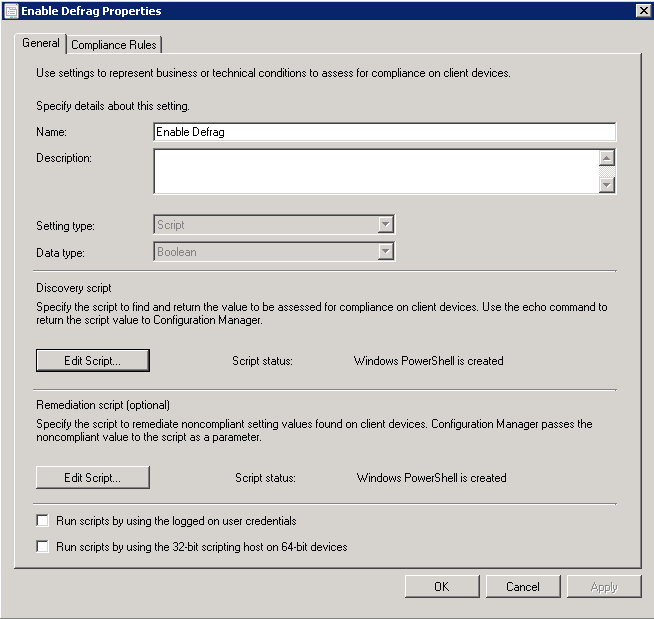 Note that in order to execute Compliance Management scripts that use Powershell, you may need to modify the client setting named “PowerShell Execution Policy” to Bypass.